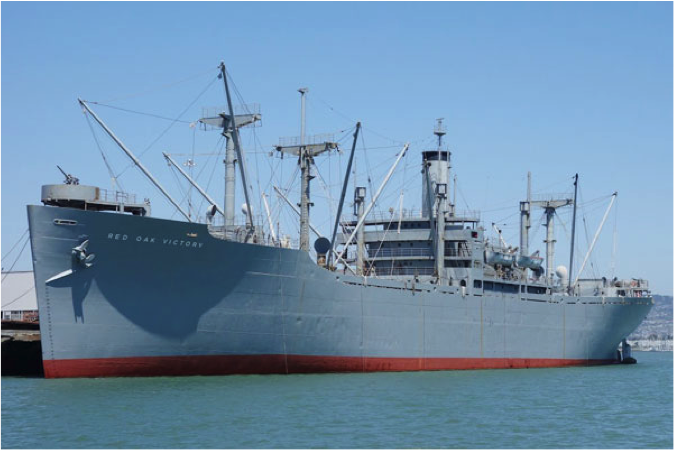 SS Red Oak Victory is the last surviving vessel of 747 ships of all types that were built at the Richmond Kaiser Shipyards during World War II. She is also one of the last surviving World War II Victory ships. The Red Oak continues to serve today as a museum ship and as a monument to the thousands of men and women who worked hard to build these ships in a time of national crisis. These ships, along with their cousins the Liberty ships, were built on an emergency basis to carry vital supplies and troops to all theaters of war. The Victory ships remain today as a symbol of the national resolve and industrial might that won the Second World War. Join the group on a tour of the Red Oak Victory Ship on Saturday, November 10, 10 A.M. With the members of both PAARA and MDARC, this will be a fascinating tour that will offer a chance to meet our neighboring radio club members. This is a drive yourself trip, but remember, car pooling is always good. There is plenty of free parking. You can also visit the Rosie the Riveter Museum after the Red Oak tour if you wish. It’s just a short drive from the ship if you want a twofer. Regular Tour - Includes all accessible areas except the lower engine room. Cost is $32.00. Full Tour - Includes all accessible areas plus the lower engine room. Cost is $36.00. Set aside Saturday, May 26 for a trip to the Intel Technologies Museum and with a BBQ to follow. The museum tour is at the Intel Mission College Blvd campus starting at 10 AM sharp. The tour takes about 1 hour. Following will be a picnic at the Sunnyvale Baylands Park Indian Grass Circle 1 picnic area beginning about 12 Noon. Tour and Picnic cost is $10. This is a drive yourself event and there is plenty of parking, but carpooling is always more fun. We will meet at the Intel visitor parking lot at 9:45 A.M. Following the tour, meet at the Sunnyvale Baylands Park, Indian Grass 1 Picnic area.park. A map will be published soon. The PAARA 80th Anniversary Banquet has been cancelled due to insufficient reservations. There wasn't enough early support to continue forward. For those who have already paid for the banquet, refunds will be issued in the form payment was made. Those who sent in checks, the checks will be returned by mail. If you have any questions, please contact Marty, W6NEV. ALL SEATS FOR THE RAILWAY TRIP ARE SOLD OUT. Note: There will be a picnic and BBQ at the Fremont Central Park/Elisabeth Lake Brook 2 picnic Area following the train ride. If you've missed the ride, join us for the BBQ at Lake Elisabeth. BBQ Only = $5 per person on-line by Credit Card or PayPal below. This is a drive yourself trip. There appears to be plenty of parking at the Sunol depot but carpool if you can. It's much more fun that way. A reminder, the train leaves at 10:30 AM. Please be at the depot by 10:00 AM. If you have any questions, please contact me. Put your NERD HATS on, we are going to the Computer History Museum. Learn about the first 2000 years of computing. There are many old, newer, and unusual computer related exhibits. We will get a private demonstration of the IBM 1401 CPU operation and a bonus. The 1401 CPU emits RF noise that can be detected with an AM radio. The museum is working on a demonstration to send QRM CW via the CPU. What a treat that will be. The tour will be docent lead in groups of about 20. Plan on about 2 to 3 hours. Entrance will be $10 per person. Please pay Marty Wayne, 1039 Bryant Way, Sunnyvale CA. Saturday, March 21. Tour will start promptly at 10 AM. (is the address and the IBM 1401 computer a coincidence?). Mark your calendars for the 7th Annual PAARAFEST. And why not celebrate the beginning of Fall while getting that last swap meet bargain. After all, who else in the world will appreciate that precious boat anchor (other than yourself of course). You are a welcome to bring your favorite pot luck dish or dip. Talk in on 147.45 simplex. You don't have anything to bring? No worries, we have a bumper crop of food and tons of cool stuff to go through. If you have a dish or a desert you want to bring, please do! Who: PAARA club members and families, 50MHz and UP members and families. What: A combination of a bbq / club fundraiser, get together and mingle, and a time to swap out all your ham-related treasures! Lunch - $5: All you can eat grilled hamburgers, brats, chips, dips - ALL proceeds go to PAARA. Bottomless Beer - $5: All you can drink (and still be able to drive), - ALL proceeds go to PAARA. All other Drinks – 1$ each: All other chilled drink choices except the beer, - ALL proceeds go to PAARA. RSVP: asap if you want to reserve space for selling spot OR if you're stopping by. Please email to Joel at KD6W@arrl.net to let him know you are coming to PAARAFEST 2014! Come join us on a field trip to the Military Vehicle Technology Foundation (MVTF). Learn about the many and varied types of military vehicles and the process of restoration from discovery of a vehicle to the final result. MVTF has a collection of over 240 vehicles. There are two tour times, 10:00 AM and 1:00 PM. The 10:00 AM tour can accommodate 32 people and the 1:00 PM, 34 people. The tour takes about 2 hours. Because of limited parking space at MVTF site, we encourage car pooling. A good place to meet for car pooling is at the Cubberley Community Center, 4000 Middlefield Road, Palo Alto. There is ample parking in the Cubberley main parking lot to the East of the facility (directly across from Montrose Ave). Directions will be posted to the parking lot and the MVTF site on the PAARA website when available. This promises to be a fun and interesting field trip. To reserve a spot please contact Marty at w6nev@arrl.net or call me at 408-234-8023. Give your first and last name, your call, how many are coming, and whether you want the 10 AM or 1 PM tour. If you sign up, please show up. We are responsible for all reservations whether they at used or not. 391 contacts, 25 countries - WOW what fun! What a wonderful event Pacificon 2013 was again this year. Lots of speakers, lots of people, lots of vendors, and even some prize winners. As you know PAARA operated the HF Special Events Station, W6P. We had a great time. The station went up and was operational in about four hours. That time included a couple of do-over's and some idle time. By Friday noon, we had one station up and working. By 1:00 PM, two more were on the air. The stations were an Icom IC-756Pro, a Yaesu FT-1000MP, and an Elecraft K3 all running 100 Watts. By 3 PM Saturday, the Icom and the Yaesu were feeding 500 Watt amplifiers and by 9 PM Saturday, the Elecraft also had a 500 Watt amplifier behind it. This was a really fantastic effort by PAARA members working together. I especially have to thank Rick, N6DQ for the use of his trailer, HEX Beam, Radio, two amplifiers and almost all the interface cabling. We initially activated 20, 15 and 10 Meters using Rick Huisman's tower trailer and HEX beam. What a crowd of looky-loos that arrangement created. Rick could be a spokesman for both K4KIO HEX Beams and Texas Bragg Trailers. Tom Schiller, N6BT brought one of his new 40 Meter Verticals that worked very well. Saturday after the flea market cleared out we strung 80 and 40 Meter dipoles courtesy of Rebar, N6DB. They worked very well and carried most of the contact load Saturday night. Rebar worked from about 9 PM Saturday night until 8 AM Sunday morning. What an effort. On Saturday there was also a 2 Meter Parachute Mobile rig set up so contacts with the jumpers could be made. John, KI6BEN handled that station and what a crowd it drew. Thanks John. Unfortunately, a count of visitors and operators wasn't taken but I know there were a lot. At times one couldn't move in the tent. A real high point is when a lad of about 9, made his first ever ham radio contact with a station in Belgium. He was so excited. I think we may soon have a new ham. Darryl Presley, KI6LDM; Rebar Rebarchik, N6DB. We of course thank the Mount Diablo Amateur Radio Club for giving us this opportunity. It was a blast for me and I hope that is true for all involved. Just a heads up, we have been asked to support the Pacificon 2014 Special Events Station W6P again next year. The dates are Friday, Oct 10 through Sunday, Oct 12, 2014. Put those dates on your calendar and join in the fun. I look forward to having another successful event next year. I also look forward to working with all of you again and hopefully many more from PAARA. We have a great club. Let's again take the opportunity to show the amateur radio community how really great we are. Mark your calendars for the 6th Annual PAARAFEST. And why not celebrate the beginning of Fall while getting that last swap meet bargain. After all, who else in the world will appreciate that precious boat anchor (other than yourself of course). You are a welcome to bring your favorite pot luck dish or dip. Talk in on 147.45 simplex. You don’t have anything to bring? No worries, we have a bumper crop of food and tons of cool stuff to go through. Lunch - $5: All you can eat grilled hamburgers, hotdogs, chips, dips - ALL proceeds go to PAARA. All other Drinks – 1$: All other chilled drink choices except the beer, - ALL proceeds go to PAARA. RSVP: no later than 9/21/2013 to reserve a selling spot OR if you’re stopping by. Please email to Joel at KD6W@arrl.net to let him know you are coming to PAARAFEST 2013! PAARA will be heading up the W6P Radio operation at Pacificon this year. Most of the equipment will be furnished by the Mt. Diablo Amateur Radio Club. The radio station will be set up on Friday morning, Oct. 11. It will operate Friday evening, Saturday, and Sunday morning then be taken down Sunday afternoon. I am looking for people to help get the station up and on the air; to operate during the active hours. Twenty four hour operation is not necessary unless someone wants to volunteer for the overnight shifts. This will be a fun event with no pressure like Field Day. I hope many of you would like to become involved and participate at any level. Please contact me by email at mcwayne2@comcast.net or w6nev@arrl.net. If you want to chat, call me at 408-234-8023 (cell, best) or 408-246-7531 (home). Come join the fun and help promote ham radio and PAARA at Pacificon. Help the California Historic Radio Society's celebrate Radio Day by the Bay. This is the 2013 installment of the annual CHRS fund raising event. There will be an auction of vintage radios and ham gear, live music by The Joyful Noise Jazz Band, a live radio play by the Broadcast Legends, a vintage electronic flea market, food, tours of KRE, living history interviews and more. You will also be able to operate W6CF, the James Maxwell Memorial Amateur Radio Station. A $5 per person donation will be asked for at the gate. This will be a full day of radio fun. Lunch is about $7.00. Gates open a 9 AM. Show starts at 10 AM. The CHRS site is located at 601 Ashby Ave, Berkeley, CA. This is a drive yourself or carpool field trip. Please make your own arrangements to get there. I will help coordinate. If there are any questions, please contact me at w6nev@arrl.net or call 408-246-7531. PAARA is visiting the Marine Radio Historical Society station KPH/KSM. This coast station was one of several marine communication transmitting and receiving stations located around the globe. The field trip will include visits to both the transmitting and receiving sites. Transportation to and from the site will be by bus. As is part of the PAARA tradition, we will be well fed with hamburgers and accompaniments. Reserve your seats while there are still seats available! Going: Leave 701 Laurel St, Menlo Park CA at 8:00 AM. Return: Leave KSM/KPH site approx 3:30 PM. Please make the checks payable to PAARA and include the name(s) and call(s) for each person going on the trip. The Foothills Amateur Radio Society (FARS) and the Palo Alto Amateur Radio Association (PAARA) present this ham radio event and fete. This annual event is open to anyone who wants to attend, but reservations are required. All members are encouraged to sign up now for this special annual event. Bring a spouse or a friend and of course bring a few dollars for the raffle.